With the generous support of its readers, The Atlantic is launching a program to help cultivate a new generation of public-service journalists. We are looking for emerging writers who are interested in working with The Atlantic’s editors to report and write a portfolio piece or series. The residency lasts three months and comes with a $15,000 stipend. The residency is intended for journalists early in their career who are looking for an opportunity to break through with a substantive reporting project. That project should be an ambitious public-interest story that can be reported and edited within the three-month residency. The topic is open but should fit broadly within the history of Atlantic coverage. To apply, fill in the form at this link, or click “Apply Now” above. The most important part of the application is a pitch of no more than 500 words. Your pitch should give a sense of the question the reporter will be asking and how you’ll strive to answer it. Include links to clips that demonstrate your ability to execute a story like this. The pitch will be evaluated on the merits of its narrative potential, its impact (how many people it will affect and how seriously), and whether it demonstrates an understanding of The Atlantic’s voice and coverage. Pitches are due by the end of the day on January 27. Start date is negotiable, but we expect it to begin as soon as reasonably possible. The Masthead is The Atlantic’s new membership program. Members receive exclusive stories and insights, along with ad-free web browsing and other perks. They also support a sustainable future for journalism, including through this residency. While some Masthead stories are exclusive for members, articles published under the residency will be made available to the full Atlantic readership. 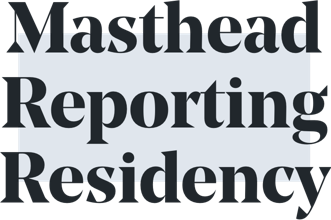 The recipient of the residency should be prepared to offer Masthead members an exclusive window into the reporting process, in the form of reporters-notebook stories, interviews about the reporting process, and other similar forms of secondary coverage. Would I need to work out of The Atlantic’s offices during the residency? No. We may request that you make a few appearances in our office at mutually agreeable times, particularly at the outset of your reporting, as well as during the editing process. But you should feel free to pitch reporting that would not be possible from our headquarters in DC or New York. How much research or reporting should I do to inform my pitch before I send it? Ideally you’ll have done enough to understand the potential impact of the story you hope to report, how much coverage (whether in The Atlantic or elsewhere) has already touched on the subject you propose to cover, and how your piece would advance the public’s understanding of that subject. If your pitch seems to overlap too much with an existing body of coverage, it’s unlikely to succeed. Do you have any tips for structuring or writing my pitch? Make sure you understand the difference between a story and a topic, and that you’re far enough along in your thinking that you can pitch us the former. Think of your pitch as the beginning of your story: Hook us from the first sentence, compel us with your description of where you’d go next, and leave us hungry to read more. The quality, clarity, and economy of the writing in your pitch will give us strong hints about the story or stories you might ultimately deliver. Is additional funding available for reporting or travel expenses? No, the $15,000 stipend is meant to be inclusive of all expenses, including any necessary travel to or from The Atlantic’s offices. You will be responsible for any taxes. Please budget accordingly. Must the story be print? What about video or audio pitches? For now, The Atlantic is primarily interested in written articles for the residency. That said, we welcome stories that include audio or video as secondary components. Where will my writing be published? Like all commissioned work, stories for the residency aren’t guaranteed to be published by The Atlantic. That said, the most likely home for your story is TheAtlantic.com. In the event that the editors determine the work isn’t suitable for The Atlantic, you would be free to pitch it elsewhere. Will I be considered a member of The Atlantic’s staff during the residency? This is not a staff position; you will not be an employee of The Atlantic. That said, you will be free — and encouraged! — to identify yourself as a Masthead Reporting Resident. This is a terrific opportunity, but it conflicts with my full-time job. What are my options? We expect that the scope and ambition of the reporting project undertaken during the residency will require your full attention. You may be able to take a book leave, or some other type of sabbatical, especially if you work at a media organization. We recommend that you explore that possibility with your employers before you submit your pitch.